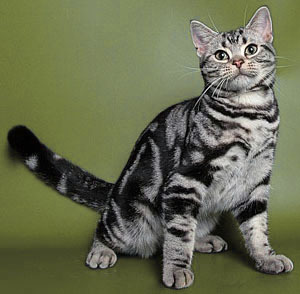 The American Shorthair cat originated in the United States, and is one of the oldest cat breeds in North America. This breed of cat comes in up to eighty different colors, and has several varying color patterns as well. The most common type of American Shorthair cat is the Silver Tabby, and it is also the most popular color of this type of cat. American Shorthair cats tend to be self sufficient and easy going and are therefore wonderful to have as pets. These are Cats built on large strong muscular lines with thick hard fur. Their faces are full cheeked with round eyes that are sometimes tilted. Another characteristic that the American Shorthair cats have are large heads that are longer than they are wide. They have slightly concave noses and their ears are round-tipped. These cats have legs that are muscular and of medium length. They tend to weigh between eight and fifteen pounds. These cats make great pets. They are very affection and have a very calm disposition. They are low maintenance cats and do not need a lot of special care or frequent visits to the cat groomers. Their call is usually quite soft and low. American Shorthair cats enjoy company and prefer not to be left alone. You will find that most owners have one or more other cats as company for their American Shorthair cat. They are very friendly and playful, and get along well with other pets and children. Homes with lots of people or many kids are an ideal environment for these cats. They remain playful all their lives. They can be trained because they are very intelligent and clever. These great qualities make them the most popular pets in North America.